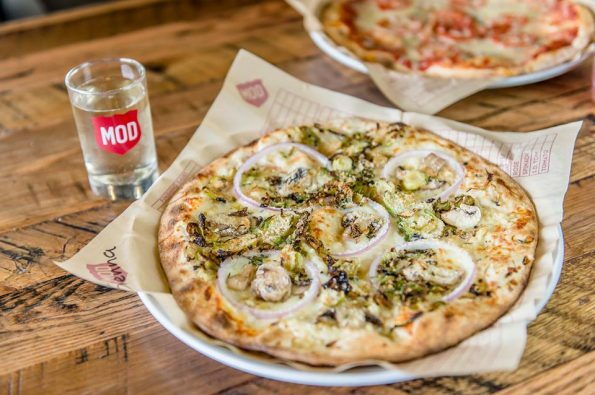 MOD Pizza, the pioneer of fast casual pizza and fastest growing restaurant chain in the United States, is set to celebrate summer with the return of its Sienna pizza (with a twist). The Sienna, first introduced in 2008, features a delectable garlic rub, red onions, sliced mushrooms, a hint of rosemary, mozzarella and grated Parmesan cheeses. Back by popular demand, MOD will be adding a new spin to the Sienna with the addition of roasted Brussels sprouts. This new take on the classic Sienna pizza is available now through September 30 at all of MOD’s 139 locations nationwide. As an added bonus, guests will have the option of adding the roasted Brussels sprouts to any pizza or salad during this limited run. In addition to the special summertime Sienna, guests can order any one of MOD’s nine classic, artisan-style pizzas or build their own creation choosing from more than 45 signature sauce, cheese and topping options – all for one price. MOD also offers customized, hand-tossed salads, milkshakes, fresh-brewed iced teas, lemonades and local craft beer and wine, where available. MOD currently has locations in 17 states, including Arizona, California, Colorado, Idaho, Illinois, Maryland, Michigan, Missouri, New Jersey, North Carolina, Oregon, Pennsylvania, South Carolina, Texas, Virginia, Washington and Wisconsin. MOD also opened its first international location in the United Kingdom just last month. For more information about MOD Pizza, please visit www.modpizza.com. MOD Pizza is the pioneer of the fast casual pizza segment, founded in Seattle in 2008 by entrepreneurs Scott and Ally Svenson. MOD’s individual artisan-style pizzas are made on demand, allowing customers to create their own pizzas and salads, using fresh-pressed dough, signature sauces and over 30 toppings, for one price. With more than 135 locations across 17 states, MOD is committed to a purpose–led culture and being a force for good in communities across the country, creating not only a cool place to eat, but an inspired place to work. MOD was recently ranked as America’s fastest growing chain restaurant by Technomic. In 2015, MOD earned a spot on the Inc. 5000 list as one of the fastest growing private companies in America and was recognized by Fortune as one of the “20 Best Workplaces in Retail” for its progressive hiring practices and career growth opportunities. For more information, please visit www.modpizza.com or connect with the brand via Facebook, Twitter or Instagram.